The Arade 1 shipwreck was found in 1970 during dredging operations and explored by a team of local sports divers. The ship disappeared again for the subsequent decades until the Centro Nacional de Arqueologia Náutica e Subaquática (CNANS) chose to undertake a survey of the river-bed aimed at locating the previous ships and finding several others. Students and faculty of the Texas A&M ShipLAB were invited to record the Arade 1 remains over several field seasons organized between 2001 to 2005, prior to dismantling the hull and sending it to the CNANS warehouse in Lisbon for further study. Dendrochronological dating, based on a multiple samples, indicate the timbers were felled in the last quarter of the 16th century from the Pays de la Loire forest in northwestern France. This project took place in 2001/2002 and was developed in by a joint team from Texas A&M University Nautical Archaeological Program and the Centro Nacional de Arqueologia Náutica e Subaquática, Portugal. Not much is known about this ship, except that it was built in the north of France and lost at the mouth of the Arade River, Portugal, sometime in the last quarter of the 16th century. We do not have information on the cause of this ship’s loss. The cargo was possibly salvaged, given the shallow depth at which is was found, but we did not find a clear reason for its loss. This site was found in 1970, during dredging works at the mouth of the Arade River. It had been buried for sometime when the dredging works exposed part of its bow structure on the slope surrounding the dredged area. It was photographed and inspected by sport divers in subsequent summers. The mouth of the Arade River has changed substantially in time. According to a 12th-Century report, the mouth of the river was further out, near Ponta do Altar, and the river ran close to the cliffs situated on its left margin. This is confirmed in an 1800 report signed by Baltazer de Azevedo Coutinho, Captain of the Royal Corp of Engineers. Previously encompassing a few small islets and sandbanks in middle of its present bed, the Arade River ran to the sea through three narrow channels. The tsunami that followed the earthquake of 1755 is said to have been at least partially responsible for the disappearance of these islets, and the change of the river’s course about one kilometer to the west. As a consequence of the changes in its course and the silting provoked by the tidal waves since 1755, in the early 19th century the Arade mouth presented a depth of only 4.80 m on high tide and 2.4 m at the lowest tide. Accumulation of sand on both margins of the river mouth consolidated its new course, and winter floods broke through the SW channel. In the beginning of the 20th century, the beauty of the landscape and the amenity of the climate brought the first families to spend holidays at Praia da Rocha, which was the best known and more frequented in the whole south of Portugal already by 1910. Data from the period 1916-1926 shows that the mouth of the Arade River was unstable, presenting varying depths as the main channel path varied. In 1926 and 1927 the sandbanks were dredged for the first time, as a developing fishing industry, associated to a growth of a young preserves industry, called for better conditions for the vessels entering and leaving the river. Although impressive – a total of 360.000 m3 of sand were dredged and deposited on the bottoms in front of Ponta do Altar promontory – these dredging works were not very successful, as the river quickly re-established its ancient profile. By 1936 the river mouth was again shallow and unstable. But the dredging works had another effect: the large sandy cordon that formed Praia da Rocha started to erode. During the decade of the 1950s two jetties were built to protect and regularize the mouth of the river, and the construction of a commercial harbor at Portimão was started. The construction of the first of two jetties that protect the harbor started in 1948 and completed in 1951. Although the expected regularization of the river bottom was achieved, the construction of the jetties may have impeded the natural shift of sediments along the coast, and furthered the disappearance of sand at Praia da Rocha, situated immediately to the west. In 1968 an area inside the jetties – the “anteporto” – was dredged to a depth of eight meters, and the sand deposited in front of Praia da Rocha, in the hope that these sediments would stop the disappearance of that beach. This did not work, and in 1970 a large portion of the “anteporto” area was dredged again to a depth of eight meters. This time the sediments – about 830.000 m3 – were deposited on the beach, at Praia da Rocha. During the course of the 1970 dredging works five shipwrecks are said to have been hit by the dredges. In spite of all the attention given to it by the press, which included the national television, nothing was done to protect them, and they were either destroyed or left to rot. Parts may have been buried on the slope of the dredged area. Maintenance of the depths obtained in 1970 forced other dredging campaigns during the decade of the 1980s, starting on that same year. Again shipwrecks are said to have been hit and partially or totally destroyed, generating further public outcry, which did not trigger any action from the harbor authority nor, for that matter, from the government. 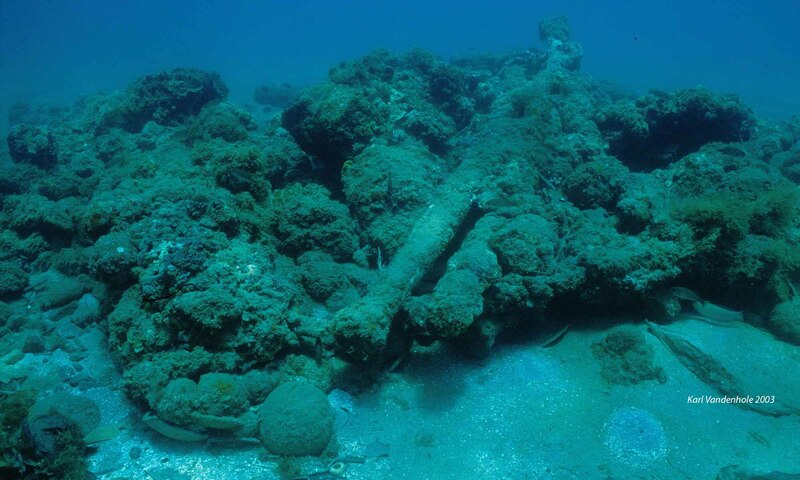 The Arade 1 shipwreck was buried sometime after sinking, and part of its wooden structure was very well preserved. Since there were few artifacts, this shipwreck was eventually forgotten and abandoned. During the decade following its exposure the Arade 1 hull decayed, broke flat, and was covered by sediments again. In the summer of 2001 Centro Nacional de Arqueologia Náutica e Subaquática (CNANS), the Portuguese agency for nautical archaeology, relocated the site and secured an agreement with the local municipality and museum for a long-term project of excavation, study, and conservation. This project was part of a larger project, which aimed at surveying and studying of the Arade River underwater cultural heritage. In 2001 and 2002, a team of students from the ShipLAB at Texas A&M University was invited to participate on the excavation of this shipwreck. The site consists of two sections of coherent structure that correspond to the lower portion of the vessel’s hull towards the bow. The further eastern component includes large bow floor timbers and possible the forward tail frame and the beginning of the pre-designed section of the hull. The western section of the site includes part of amidships with flat floors and a pump sump cut into the adjoining floor timbers. No anchors were found associated with this shipwreck. One concreted gun was located, but it was not recovered and therefore difficult to date. For now, we can only state that it does not contradict with the time frame established. The hull remains were found in two separate articulated sections of the hull laying on its port side. The upper section of the ship seems to correspond to the bow and was preserved over an area of 7 x 3 m. It was composed of a keel, stem, apron, 18 partial frames, four strakes of ceiling planking, and six strakes of the outer planking. The keel was preserved to a length of 6.05 m on the upper portion of the shipwreck, and at least 1 m on its lower portion. Much eroded, it seemed to have a T-shaped section with a trapezoidal body. Later, after the 2003 field season, it was found to have a trapezoidal section with the rabbet opened below its upper surface, leaving about 3 cm of rising wood on the keel above the back rabbet line. The stem also presents a trapezoidal section with rectangular rabbets, but without rising wood. It was connected to the keel with a flat, vertical scarf. The remains of what seemed to be an apron were attached to the upper face of the keel at its forward end. It was much eroded and no details could be recorded. The remains of 18 frames were partially preserved, with floor timbers, first and second futtocks. Central floor timbers were placed with 20 cm of clear space between them and presented 16 cm molded. Their lower surfaces appeared smother and showed better adherence to the hull planking. Bow floor timbers were placed over the keel at less regular intervals, although the average distance between them is also 20 cm. However, since these bow frames presented heavier scantlings, the average value of the room and space varied greatly between the previous group with 35 cm for central frames and 42.1 cm for the bow frames. Hull planking was 4.5 cm thick and extended over a width of over 2 m to the north (starboard side), forming seven continuous strakes with one stealer present. To port, only two strakes were preserved. It is possible there were seven fair runs of planking, all showing a maximum width of 37 or 38 cm, tapering gently towards the presumed bow. On each strake the planks were connected through flat scarfs. No traces of caulking were found in 2002. Some timbers showed a white coating on the inside. Its nature is so far unknown. Both small iron nails, with square shanks about 4 x 4 mm in section, and treenails about 2.5 to 3 cm in diameter were found, as well as iron bolts around 2.8 cm in diameter. The keel scarfs may have been fastened with iron nails, since remains of iron concretions were spotted on the lateral surfaces of the keel, in the supposed connection of the keel to the stem. Floor timbers were fastened to the keel with one, two, or three treenails. The keel was fastened to the keelson or mast step with iron bolts in at least two places. The planking was fastened to the frames with one or two treenails per plank and per frame. The ceiling was also fastened to the frames with treenails, although it is not possible currently to say how many treenails were inserted from the outside, through the outer planking and frames, and how many (if any) were inserted from the inside. The artifact collection found within the 10 x 10 m area is small and quite poor. It includes a cast iron gun, a pewter plate, and a copper cauldron found during the 2001 field season. The following year an olive jar and three dead-eyes were located in 2002, but the majority of the 114 artifacts were ceramics sherds. Beyond the various ceramic sherds, the only other personal item recovered is a single pewter plate. There is evidence for a mark, but it seems to have completely eroded away. The three heart blocks and a few pieces of rope were found on the port side of the shipwreck. This particular type of block – in Portuguese sapatas trincadas – is documented in the second half of the 16th century, used for tensioning either the forestay or the shrouds. Data retrieved in 2002 show a hull shape compatible with a flat floor amidships, as suggested by earlier sketches of this area in 1970. Lines drawings from the bow section of the hull are quite fair and suggest a flat floor amidships. Arade 1’s overall measurements could be around 4-5 m in beam, around 12-15 m long, and 2-2.5 m depth of hold. The scantlings seem heavy for a vessel at the lower end of this limit, but fairly normal for a vessel at the other extreme. Castro, F., 2006, The Arade 1 shipwreck. A small ship at the mouth of the Arade river, Portugal. In L. K. Blue, Hocker, F. M. and Englert, A. (eds. ), Connected by the sea: Proceedings of the Tenth International Symposium on Boat and Ship Archaeology, Roskilde 2003, 300-305. Oxford, England.